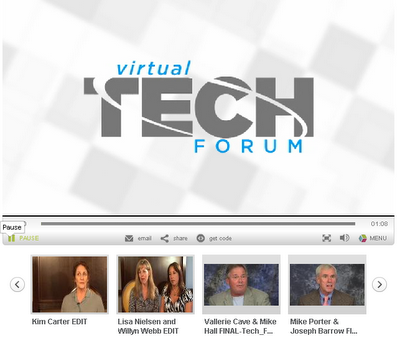 Tech & Learning's Virtual Tech Forum provided a fantastic way to engage in stimulating conversation with innovative educators on a variety of provocative topics that are the key to preparing 21st century learners. The format allowed for participants to watch a featured video and then chat about the topic. The chats were fast-paced, action-packed and full of a whole lot of stimulating conversation and ideas. There is no reason the conversation has to end there. These videos are still available (and free of charge) for anyone who wants to start conversation or keep it going. Simply show the video and invite viewers to discuss either verbally or via chat as we did during the original tech forum. You can take things a step further by inviting these educators to chat with you virtually via Skype or using an instant message service. Here are the video topics. To watch any of these videos, simply click on the picture below which will take you to each of the videos. Enjoy! 21-century classroom is the world. Internet 2.0 and high bandwidth connectivity provides students with great opportunities to learn from experts, communication with other learners across the globe and be exposed to other cultures. 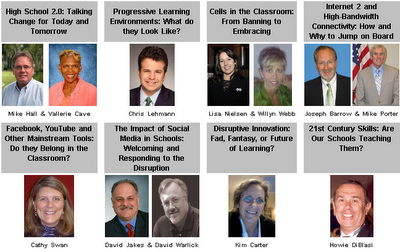 using internet 2.0 is engaging and empowering learning for all students learners. Technology provides access to the world. I believe bringing 21st century skills into the classroom is just as important as making sure our students are passing standardized testing. As Howie DiBlasi talks about, schools systems have to make sure their teachers and staff are will to learn and implement these skill into their lessons, and if they are not they must be asked to step aside. It is also important for superintendents to provide teachers and principals with the proper training needed to bring 21st century skills into our classrooms. I watched the video about using cells in the classroom that Lisa and Willyn did. I was really impressed with the thought process; involving students instead of imposing rules from on high. Using technology instead of banning it. Even simple stuff, like using phones to time a speech, things that are so basic that I didn't even think of them. What really stuck with me, though, is that students are to be considered partners in learning, which of course they should be! However, their use of mobile tech probably exceeds that of most instructors, so part of the process has to include teachers NOT being intimidated by students using cell phones in their classroom. I watched the video regarding Facebook and YouTube in the classroom. I personally do not have a face book account, but after watching this video I am seeing things from another perspective. Implementing something like face book that the students are so involved in could make the students more interested in school material. They already spend so much time on this site, why not get homework assignments completed while they are at it? I agree with the author that facebook and other social networks can serve to enhance students' participation and learning in the classroom. I think that having facilitators teach student computer ethics is just as important as teaching them other social norms. I was very upset when a lesson I put together that included a video (Hands as Calculators) was blocked because it was on YouTube. I actually brought my laptop to school the next day to show the video. My students learned an easy way to do multiplication using their hands. Students enjoy using the computer and many have accounts on facebookfor kids. So, yes, with proper guidance, social networks can be a wonderful and informative educational tool. This video was really enlightening. I am a teacher who is always looking for new ways to incorporate technology into the classroom. However, I have not been able to come up with practical ways to do so with a cell phone. I think the ideas in this video are excellent and the rationale for using cell phones in the classroom makes perfect sense. Why would teachers not embrace a tool that students are most comfortable with to maximize learning? I love the idea of easing into cell phone use as a teaching tool by having a one cell phone lesson. I equally love the idea of thinking of a cell phone just like any other teaching tool, where it has to be managed and has times to be used and times where it is not needed. I found this video to be very enlightening. 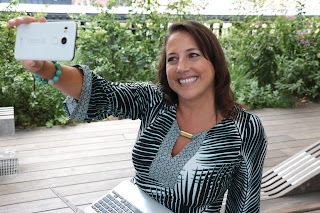 I am a teacher who is always looking for new ways to bring technology into the classroom. However, I have not been able to find practical uses for cell phones in the classroom that can beat the bans. This video offered many applications for using cell phones both inside the classroom and out to facilitate learning. I love the idea of easing into such use by conducting one cell phone lessons. I equally love the idea of viewing cell phones the same as any other clasrrom resource. It should be viewed as a tool that needs to be managed. One that has specific uses and applications and as one that at times is put to rest to explore other types of learning.